Recently media reports that the world famous textile embroidery handicraft of 'Lucknow Zardozi' is now a brand i.e., it got the GI tag (Geographical Indicator tag). With this around 2,00,000 people directly associated with over 10,000 micro and small enterprises engaged in manufacturing of Zardozi products like apparels, home furnishing, shoes, bags, etc., will get the Geographical Indications (GIs) tag. The 'Zardozi' craft has been traditionally prevalent in Lucknow and the six surrounding districts of Barabanki, Unnao, Sitapur, Rae Bareli, Hardoi and Amethi, reports media. With GI registration, the craft has gained an official recognition, which would help the various stakeholders in product differentiation, checking imitation and deriving more economic benefit from its trade. A GI tag is defined as that the goods produced in the particular region are the intellectual property of that region. India have many GI brands like Basmati Rice, Darjeeling Tea, and Kancheepuram silk saree, Alphonso Mango, Nagpur Orange, Kolhapuri Chappal, Bikaneri Bhujia, etc, even Lucknow has the distinction of three GI brands viz. Chikankari, Zardozi and Dussehri mango. Brocades and Sarees of Varanadi and handmade carpets of Bhadohi are registered under the handicraft goods while Sarees & Fabrics of Mau are registered under textile goods of GI Act 1999 under the Section 2 (f). The GI tag ensures that none other than those registered as authorised users (or at least those residing inside the geographic territory) are allowed to use the popular product name. Darjeeling tea became the first GI tagged product in India, in 2004-05, since then till now over 170 more had been added to the list, this include Meerut scissors, Ganjam Kewda Flower, Ganjam Kewda Rooh, Surat Zari Craft, Nashik Grapes and many others. Karnataka has the highest number of GI tags with 23 GIs. Such protection will definitely change the overall picture of these regions and also the economic conditions of the poor artisans and producers. A geographical indication (GI) is a name or sign used on certain products which corresponds to a specific geographical location or origin (e.g. a town, region, or country). The use of a GI may act as a certification that the product possesses certain qualities, or enjoys a certain reputation, due to its geographical origin. India, as a member of the World Trade Organization (WTO), enacted the Geographical Indications of Goods (Registration & Protection) Act, 1999 has come into force with effect from September 15, 2003. Under Articles 1 (2) and 10 of the Paris Convention for the Protection of Industrial Property, geographical indications are covered as an element of Intellectual Property Rights (IPRs). They are also covered under Articles 22 to 24 of the Trade Related Aspects of Intellectual Property Rights (TRIPS) Agreement, which was part of the Agreements concluding the Uruguay Round of GATT negotiations. The Government of India have been protecting goods through GI with a particular region since 2003. The TRIPs Agreement defines "geographical indications" as indications that identify a good as originating in the territory of a Member/ Region or locality in that territory, where a given quality, reputation or other characteristic of the good is essentially attributable to its geographic origin. Geographical indications are valuable to producers for the same reason that trademarks are valuable. 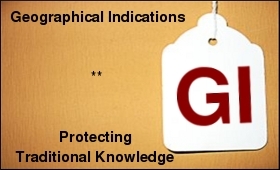 Geographical indications serve the same functions as trademarks, because like trademarks they are: source-identifiers; guarantees of quality; and valuable business interests. With registration of 'Lucknow Zardozi' as GI, these regions will get benefit to confer legal protection to Geographical Indications in India. GI prevents unauthorized use of a registered Geographical Indication by others. GI enables seeking legal protection in other WTO member countries and boosts exports of Indian Geographical indications by providing legal protection. The biggest advantage of Geographical indication is that by protecting manufacturers' right the GI promotes economic prosperity of producers. Registration for GI is not compulsory, but registration affords better legal protection to facilitate an action against infringement. The registered proprietor and authorized users can initiate infringement actions. The authorized users can exercise right to use the Geographical indication. Any association of persons, producers, organisation or authority established by or under the law can be a registered proprietor. There name should be entered in the register of GI as registered proprietor for the GI applied for. According to the law 'A producer' is a person dealing with three categories of goods, first agricultural goods including the production, processing, trading or dealing; second natural goods including exploiting, trading or dealing; and third handicrafts or industrial goods including making, manufacturing, trading or dealing. Only an authorized user has the exclusive rights to use the Geographical indication in relation to goods in respect of which it is registered. The registration of a Geographical Indication is for a period of ten years. And it is possible to renew it further for periods of 10 years each. If a registered Geographical Indications is not renewed, it is liable to be removed from the register. A Geographical Indication is a public property belonging to the producers of the concerned goods. It shall not be the subject matter of assignment, transmission, licensing, pledge, mortgage or such other agreement. However, when an authorized user dies, his right devolves on his successor in title. Whereas a Geographical Indication is used to identify goods having special Characteristics originating from a definite geographical territory. By protecting the goods we can protect the creator, community and our traditional art.